Before I get into the beer, much praise needs to be heaped upon everyone that had a hand in making this special event happen. The organization and execution was flawless, and the Aces crew were in high spirits as they hustled to deliver great craft beer and delicious food to the insatiable palates of their patrons. The breweries put their best efforts forward and really were able to come through with some memorable offerings. A huge thank you to everyone involved. I’ll start with Chicago Brewing Company, who are fresh off a gold medal win at the Great American Beer Fest with their chocolate coconut porter, aptly titled: Cocoa for Coconuts. At first sip, I wasn’t in love with this beer, however that would soon change. As the porter began to get a bit warmer, the flavors started to really open up, and I was able to see just why this beer is worthy of its gold crown. The coconuts came through heavy on the nose, but quickly gave way to sweet chocolate notes. The beer was well balanced between the flavors, which tends to be a rarity with coconut infused beers. Chicago Brewing Company also brought along two staples of theirs’ with the Old Town Brown and Hardaway IPA. Both of these are tasty beers and represent their respective styles well. If you happen to be in the southwest area of town, make sure to stop into their brewery and give their rotating lineup of beers a shot! Longtime local brewery, Big Dog’s Brewing Company has been on quite a tear lately. With such great beers as the Rebel Red and the monstrous IPA that is War Dog, it seems as if Dave Otto and crew can do no wrong! Thankfully, War Dog rose its bitter head and was in fine form on this evening. With the perfect amount of citrus and pine notes, this is one IPA you do not want to miss out on! The other stand out that they brought, was the Bourbon Barrel Aged Sled Dog. Being poured on Nitro, this stout really shined through. The bourbon was a bit heavy on the nose, but went down smoothly with a nice wood finish. Sled Dog is always a good choice, and the bourbon aging and nitro pour only amplified the already delicious brew. Joseph James Brewing Company is another local brewery who I am always excited to see at an event. They never fail to ferment up interesting beers to bring along and share with thirsty locals. Tonight, they showcased what may have been my favorite beer of the evening: a Pistachio Baklava Honey Ale. Taking a strong sniff of this was like dunking your face into a large bowl of pistachio ice cream. The pistachio flavors definitely dominated, but to a pistachio fan such as myself, this as not an issue. The honey and syrup flavors were there, but did not cut through the pistachio flavor too much. The ale had a nice, medium body, and I’m pretty sure was the first beer to sell out at the bar. Not to be outdone, they also packed along kegs of their new Black Rye Session Lager, Oaked Sour, and the recently bottled Bourbon Barrel Aged Russian Imperial Stout. I’d strongly recommend going out of your way to pick up a few bottles of the stout. It should age nicely, yet drinks just fine right now. I’m pretty excited to see what it tastes like in a year! Last but not least, we have local favorites, Tenaya Creek Brewery. 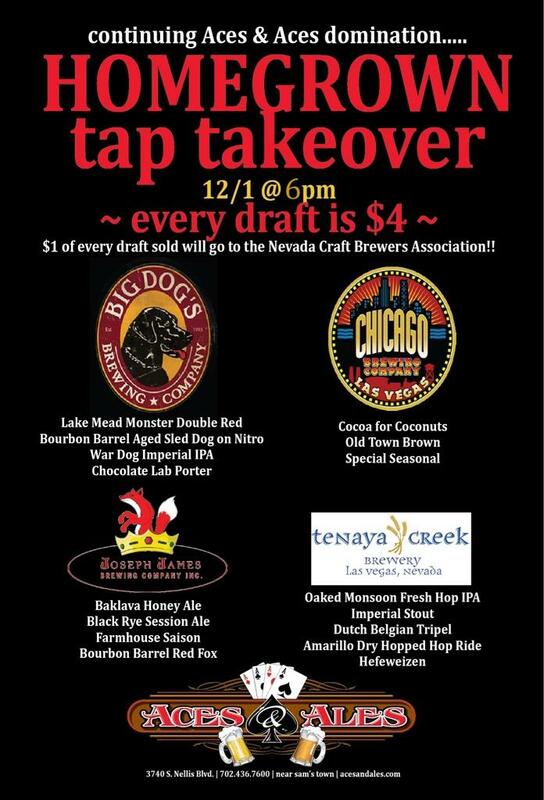 Tenaya Creek always crafts phenomenal beers, but it is not often that they put together unique brews for these kinds of events. However, they decided to pull all the stops out on this particular evening! Taking an old favorite, Hop Ride, they added a new twist by dry-hopping it with Amarillo hops, which ended up being quite the crowd pleaser! The Amarillo hops gave the already delicious Hop Ride a clean, grapefruit edge which made the beer shine even more than it already does! I really hope this one gets brewed again, because along with the aforementioned Pistachio Baklava Honey Ale, this was my pick for best beer of the night! Not be outdone, Tenaya Creek is also brewing the seasonal Monsoon IPA. They brought an Oaked version, which really showcased the hoppy power of this IPA. The heavy Cascade flavors meshed perfectly with the slightly sweet oak flavors, creating a fine drinking experience. I truly hope that we see this one make a comeback as well! Also on tap, were the new God of Thunder Baltic Porter, Belgian Style Dutch Tripel, Imperial Stout and the year-round Hefeweizen. All solid choices, but sadly, this may have been the last keg of the Tripel that we’ll see for quite a while. I didn’t get a chance to try the stout, but I hopefully will soon, as it was a favorite of mine last year. Barring any unforeseen events, we should have a post on both the stout and porter coming soon! All in all, this was just a top notch event that was a ton of fun. It’s great seeing local brewers get together, drink beer and talk shop with anyone willing to lend an ear. It’s also always fun to meet locals from all walks of life who all come together for the sole purpose of enjoying fine craft beer. I really hope we see something like this again, and again, and again. In the meantime, you can try these breweries for yourself, and check out all the great upcoming events at Aces and Ales!